ProGreen takes great pride in being a family owned and operated business. In 1989 Jim Jennings and his son Todd began operations in a rented storage space in Norcross, GA, with four employees. Primarily focused on landscape maintenance, their commitment and dedication to providing customer satisfaction and the hard work and professionalism of their employees rapidly grew the business. They moved from one storage space to two, then three, and then leased a stand alone building in '96. Todd's interest in landscape design, installation, and hardscape construction led to an even larger growth period for ProGreen as our area experienced the construction boom that began in the late 90's. 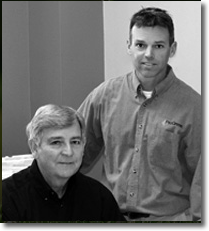 In 1998 Jim and Todd built Progreen's current 2.5 acre facility in Suwanee, GA. With a strong belief in teamwork, the Jennings have sought to bring together the best of the best when it comes to employees, vendors, suppliers, and subcontractors. They are passionate about helping others and living out the Christian values that they hold dear. Don't hesitate to let them know how they can help you with your project. Contact us today and let us know how we can help with your project. Could not have asked for a better experience. These guys are a top notch company from top to bottom. Extremely professional, courteous, and do outstanding work. Thanks to Todd, Pedro and the rest of the crew at ProGreen.